As designers most of us feel, we know just the right tone of a color and no one can challenge us. I found this interesting site which has online color challenge. I encourage designers to at least once go and take the challenge of color vision. It’s an exciting activity and does not take more then 10mins. You just need to drag and drop. The lower the score, the better color vision you have. 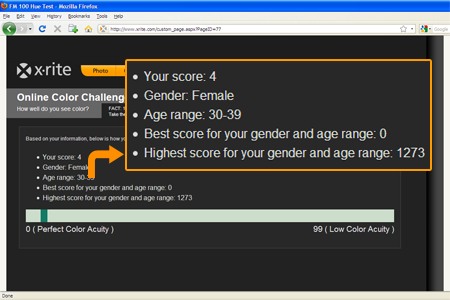 Best part of this color vision test is it tells the person in which color hue she/he has less color recognition. This not only helps you identify the gaps but gives you an opportunity to improve by allowing you to accept the challenge again. I scored 4, do share your scores. Pingback: Our world of colors « Bubbling thoughts!